With Earth Day right around the corner, we've rounded up some of our environmentally friendly and sustainably made Grommets. There are many ways to get involved and support a cleaner planet. One of things you can easily do it is to look for everyday ways you "go green." These eco-friendly products will help you easily green your daily routine on Earth Day (and beyond). √ Natural and eco-friendly materials. √ A reduced carbon footprint. Did you now that Worldwide, a trillion single-use plastic bags are used each year? That's nearly two million each minute. Why not say "no" to throwaway plastic? These reusable silicone bags hold way more than snacks—and they go from pantry to freezer, microwave, and dishwasher. Consider using these silicone storage bags as an alternative to single-use bags. Wipe off the day (heck, wipe off every day) with this one cloth. You can wick away makeup, dirt, and oil with water and this super-fine microfiber cloth. It works gently and effectively—and it’s reusable, too. Not only is this makeup removing cloth an earth-friendly swap, it will save you money. Going "green" doesn't have to be overwhelming–a few small changes can add up to make a big impact. Here at The Grommet, we work with Makers who are mindful about the environment, and who are crafting eco-friendly products from natural materials, using sustainable production methods, and focusing on reducing their carbon footprint. They've done all the hard work for you. So, if you're interested in making simple changes in the name of Mother Nature, read on. The kitchen is a great place to make a few green upgrades. Ditch the plastic bags and try Vejibag, an ingenious produce keeper that’s made of American-grown organic cotton and hand-sewn in Maine. It gives produce the humidity it needs, keeping it fresh and crisp far longer than plastic. And while you're thinking of ways to use less plastic, get the kids involved by swapping their drink pouches for Juice in the Box. This reusable juice and drink box is made from Tritan plastic; BPA and Phthalate free. Its no leak container holds eight ounces and can be filled with your own beverages (which are often much healthier). The presents were ripped open and the presents are being throroughly enjoyed -- but what about all of that used wrapping paper? Instead of tossing it in the garbage can, consider reusing it (mother earth will thank you). Make a wrapping paper wreath. This is such a fun DIY project that the whole family can get involved with. Create one using all of that discarded Christmas wrapping paper and next year you will have a new Christmas decoration to hang or give as a gift! See tutorial here. You can even make coasters! If it's not torn to pieces carefully fold it up and store for wrapping use next year. Shred it and use as packing filler. Shredded paper is perfect for protecting valuable you are storing or shipping. Use the wrapping paper to cover used (and washed) tin cans. Then, you will have festive storage for your office or kitchen supplies. Source. What do YOU do with your discarded wrapping paper? Leave a comment and share your tips! How does your garden go? If you watch the Grommet videos very closely, you might occasionally spot the Lexington Farmers Market in the background - it's the perfect setting to shoot some video for stories like ChicoBags (creator of reusable produce bags). Every Tuesday, from early summer into the fall, dozens of farmers and artisans set up shop on our village green, just across the way from Daily Grommet headquarters. And last Tuesday, Donna, Daily Grommet's master of finance, headed over to meet Charlie, "the Boston Truck Farmer." It turns out, the guys who produced the award-winning PBS documentary, "King Corn" had started a new movement last year by growing a garden right in the bed of their old Dodge truck and driving it around to urban farm sites. This year, there's a fleet of 25 trucks scattered across the country doing the same -- and Charlie, from Arlington, MA, is the Boston truck farmer. Charlie will be visiting 25 sites throughout the season, and we'll be watching for the next time he's back in our neighborhood so we can check in on his garden's progress. I especially like how these guys describe what they're doing as a "mobile community farm" ... as well as a "public art and education project." You can take a look at www.truck-farm.com to see if there's a truck farm in your neighborhood and find out more about this cool project. Going "green" it is for anyone who wants to take one step today towards doing better by the Earth. Here are several products that can help you get started. 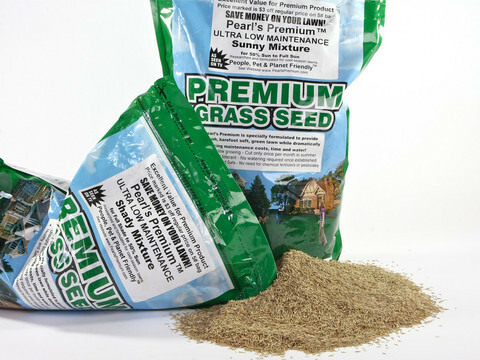 If you love a green lawn but dread the maintenance, check out Pearl’s Premium grass seed. It was developed by environmentalist Jackson Madnick, who spent six years researching lawns that grow slowly, require less water and don’t need chemical fertilizers to thrive. Grow an easy organic lawn this spring. These reusable grocery and produce bags are designed to maintain optimal humidity and air flow which will keep fruits and vegetables fresher, longer. 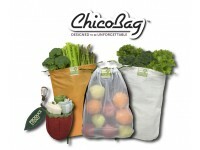 ChicoBags eliminate the need for single use plastic bags -- a much more earth friendly way to grocery shop! Tap the sun with the eGear 5-in-1 solar travel kit. The base stores energy from the sun, and you can use it to power five different attachments: a small LED flashlight, radio, fan, reading light or USB charger. You just choose the component you want, then slide it onto the body until it clicks into place. The “Zero” nylon messenger bags from Rickshaw Bagworks is designed to eliminate wasted material. Scraps created during production are used in the bags and shipping materials, so nothing gets tossed. Read more about this here. Why toss wool balls into your dryer? We’ve discovered lots of reasons. They’re a clean, natural alternative to conventional dryer sheets and fabric softeners. They can cut drying time by as much as 40%. 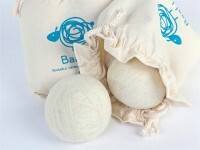 Plus, these handmade wool dryer balls are great for reducing static electricity and fluffing out wrinkles. Evan Healy takes a different approach to skincare. As a trained aesthetician, Evan believes in the skin’s ability to achieve optimal balance with just a minimum of help. 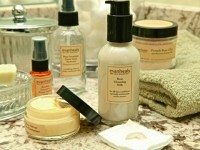 All the products in her evanhealy line are made from organic, plant-based ingredients, and there are no perfumes added. These organic skincare products will have you looking great and feeling wonderful about the ingredients you are putting on your skin. Let’s start with the obvious question: What is this thing? Lunette is a sylicone menstrual cup, a reusable enviornmentally-friendly alternative to tampons and pads that collects the menstrual flow rather than absorbs it. Sage, lavender, chamomile and coconut oil sound more like ingredients in a facial cream than a household cleaner, but that’s the beauty of these incredible cleaners from Better Life. More than 99% of the ingredients used in Better Life’s non toxic cleaning products are natural or derived from natural, renewable resources. The name Zkano is derived from a Native American word that describes “a state of being good.” That sentiment perfectly captures describes these organic cotton socks -- good for the environment and good for the people who wear them. Looking for more eco-friendly products? You can see more by browsing our Green Product gift guides. At Daily Grommet we love to tell the story behind the products that we feature. Today's story spans generations and continents. If it weren't for the act of courage taken almost a century ago around the world, this story wouldn't be able to be told today. Buy MYdrap napkins on a roll here. The founders, Antonio and Maria Guasch were workers of a textile company. They were fed up with the abuses of the owner and decided to open their own factory. After many difficulties the company was founded in 1925 in Barcelona. A few days after Antonio Guasch died. Maria did not give up and she went ahead with the business in a time when women were supposed to be at home with babies. Maria had to work extremely hard to start her fledgling business and educate her son and daughter at the same time. Her son, Jacinto Guasch took over the business and later, in 1980, the company opened a new factory in Monistrol de Montserrat, near Barcelona at the foot of the mountain. During the next 10 years the company had two factories, but in 1990 the factory in Barcelona was closed and all the production was moved to Monistrol. The old factory was sold when the old industrial area of Barcelona was converted for the Olympic games of Barcelona 1992. After a heavy textile crisis in 1991-1992 the company realized that the sector was extremely vulnerable to foreign competition coming from Asia. With the clear goal of innovating they developed their seamless technology. This technology allowed them to develop innovative and high quality product at a competitive cost. They first created Rolldrap, cotton cloths in a roll, in 1996. Today they are leaders in the Spanish market of cotton cloths for the hospitality market and the product is expanding through Europe. In 2005 they explored the possibility of developing other products that would use the same seamless technology. The idea of manufacturing textile napkins on a roll was the first step. The success in the hospitality market was immediate. The concept of a disposable textile has captivated hotels, caterers and restaurants all over the world. Following the success of the MYdrap napkins for the hospitality market they developed the same concept for the retail. In 2008 they registered the MYdrap brand. The concept of cotton napkins in a roll available in a range of colors and sizes has been an immediate success. The product has expanded all over the best stores in Europe, Japan and Canada and we wish to do the same in the USA. After being featured as one of 'Today's Style Fashion Emergency Fixes' a couple of weeks ago (see the video below) the MYdrap team has been invited back and will be featured this Thursday, April 14th. We can't wait to cheer them on and watch the US market embrace this product. Grandma Maria would be very proud. Now that we’re (finally!) thawing out after winter, we’re busy searching for excuses to get outside and enjoy the warmer weather. From camping and hiking to road trips and cycling, we can’t wait to get moving again. Our tester, Paraag Maddiwar, used the Voltaic Systems solar charger to charge his iPod twice and his camera once during his hike at Mt. Kilimanjaro in Tanzania last month. One of the challenges with a weekend camping trip or a hike, however, is that it’s not always possible to recharge your camera, cell phone, or iPod. We’re more than happy to leave the laptop at home, but who doesn’t want to listen to music and take pictures while enjoying the great outdoors? With the travel solar chargers we’re featuring today, solar charging is easier than ever. So now we definitely have no excuses to stay inside! National Park Service – This is the first place to look when you want to find parks near you or near your destination. The website even has a handy sorting feature where you can search by topic or type of activity. Tripleblaze.com – Here you can find advice on the best camping and hiking sites as well as equipment reviews. They even have information on guided trips. BestHike.com – There are lists for every continent on this website, and you can update information to add your own knowledge of the trails -- a great hiking guide. ABC-of-Hiking – This website has active forum discussions and is a great place to obtain how-to information as well as advice on hiking locations. BootsnAll – This is a one-stop travel website with information on flights, advice on destinations, and opportunities to find travel partners. BootsnAll is a great place to look if you’re planning a trip overseas, and there’s plenty of information about how best to enjoy the outdoors in great hiking destinations like New Zealand. Do you have some great resources that you use when you’re planning an outdoor getaway? We’d love to hear about them! You’ve always been cool as a cucumber, the chief cultivating officer of your luscious home garden. Each season you break new ground, ready to try out the latest gardening products and showcase the breadth of your gardening gifts. This stuff is for you. Add to the pleasure of cut flowers with these unique, reusable vases that fold completely flat for easy storage. Buy Jill-able's portable and collapsible flower vase. This no muss, no fuss organic gardening system is simple to set up, and you don’t have to worry about soil conditions, over-watering or weeding. Buy the EarthBox® flower and vegetable container gardening system. From compost and clay you get... bon bons? A sweet gift for expert and novice gardeners. Buy Moultonology's Garden Bon Bons herb seed balls. Keep your lawn and garden green with the GatorHyde hose. It's durable, lightweight and kink-free, plus it's made with recycled materials. Buy the GatorHyde heavy duty lightweight garden hose. John and Bob's soil solutions can literally add life to your plot of earth by replenishing missing microorganisms and enriching the soil’s nutrient base. Buy John & Bob's soil conditioning system. The Sky Planter suspends ferns, orchids and herbs from above, saving space and resources while decorating the ceiling and purifying the air with plant life. Buy the Boskke hanging upside down modern planters. Make the transition to an organic lawn with Pearl’s Premium lawn seed. You’ll enjoy less mowing, less watering and no runoff from harmful chemical fertilizers. Buy Pearl's Premium grass growing seed. These rugged, protective overalls do the job of typical workwear, but they're fit and constructed especially for women. Buy Rosie's Workwear work overalls for women. An orthopedic hand surgeon designed these leather gardening gloves with strategically placed pads to reduce blisters, calluses and hand fatigue. Buy Bionic Gardening Gloves. Nourish your garden with homegrown worm castings and you'll produce lovely green leafies that would make an organic farmer beam with pride. Buy the Worm Factory organic home worm composting worm bin. Want to upgrade your lunchbox? How about a solution for your achy feet after a night on the town? Check out this week's Grommets, we think you'll like them! Ecosystem Life Journals These modern, colorful notebooks from ecosystem are made of 100% post-consumer recycled paper. They come lined or blank, perfect for jotting down thoughts or sketching a quick picture. Pen or pencil, crayon or charcoal — the acid- and chlorine-free paper loves them all. Tiny perforations make it easy to remove a page when you want to, and the flexible covers can be wiped clean with a damp cloth so they keep looking new even after months of use. ($14.95) Buy Ecosystem's recycled blank writing journals here. Love In A Lunchbox. The Lunch Jar is a stainless steel container into which three covered bowls fit, stacked on top of each other. The sturdy, insulated thermos keeps hot things hot (like soup, chili or pasta) and cold things cold (salad greens, carrots or cucumber slices). The set also comes with a forked spoon and a cool carrying tote. ($46.95) Buy the Zojirushi lunch jar here. Earthling Crazy Crayons. Our recycled crayon bundle includes a box of Eco Stars. With 20 stars in each box­, you’ll have 100 nice sharp points of color for your artistic masterpieces. Or use two points at once to create parallel lines. You also get a Can of Worms, which is (fittingly) nine earthworm-shaped crayons that are perfectly sized for little hands. As a special bonus, our bundle also includes one star-shaped crazy crayon with two colors swirled together. ($17.95) Buy Earthling recycled crayons here. Falksalt Gourmet Salt. This pure sea salt is naturally unrefined and harvested by hand from the Mediterranean Sea. The evaporation process can take up to two years to achieve the proper texture and flavor – but this extraordinary seasoning is worth the wait. It’s salty, not bitter, and the purity of the sea salt flakes translates into a light sweetness that enhances the flavor of your favorite dishes. (Boxed set of four - $24.95) Buy Falksalt gourmet flake sea salt here. AfterSoles Ballet Flats. We’ve all been there, wincing in pain after a night of standing, walking and partying in strappy stilettos. Sure, you could take off your heels and dance barefooted for the last few songs. But if shoeless isn’t your style, we’ve found a chic solution for aching arches. AfterSoles are slim ballet flats that roll up to the size of a cell phone. ($14.95) buy rollable women's ballet flats here.